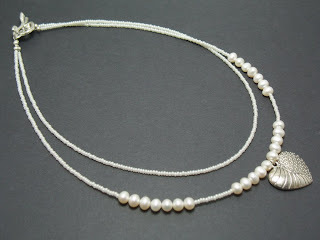 These necklaces were ordered by a friend to give to her nieces and nephew, as well as one for herself. We found the wooden beads featured in the center at a bead show in Tacoma. A friend gave me some beads that belonged to her mother-law who had recently passed away. 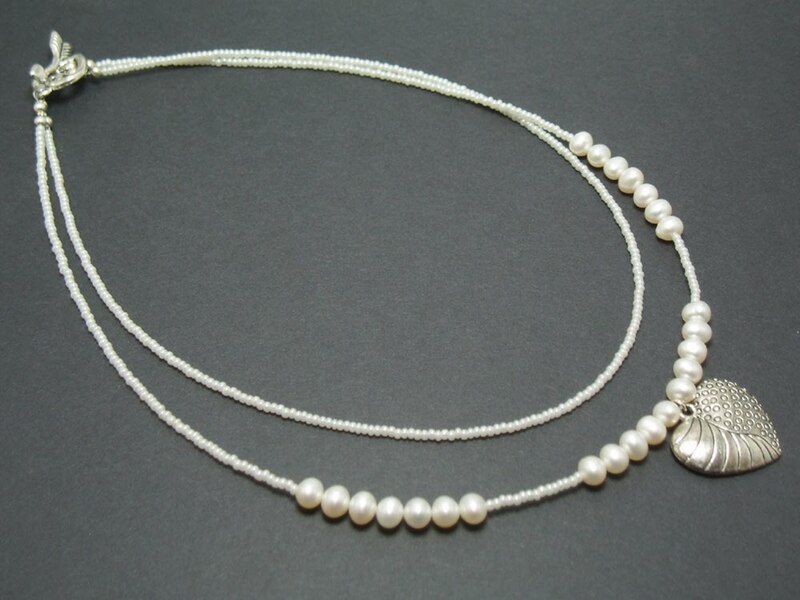 I thought it might be nice to make something that she and her step-daughter could wear as a remembrance. 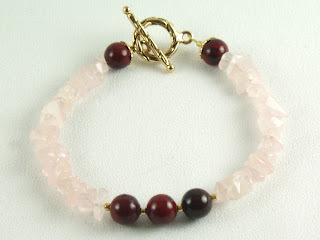 The bracelets are a combination of the gifted beads (pink quartz and a red stone). 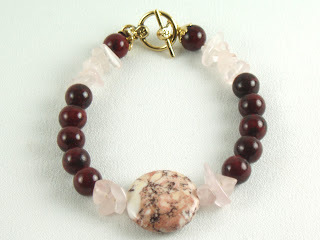 The first one has a focal bead made of pink magic jasper. When I was back in MN this summer a friend gave me a baggie filled with the remnants of a jade and amethyst necklace - it was so forlorn! She hoped I could make a new necklace for her with the parts. 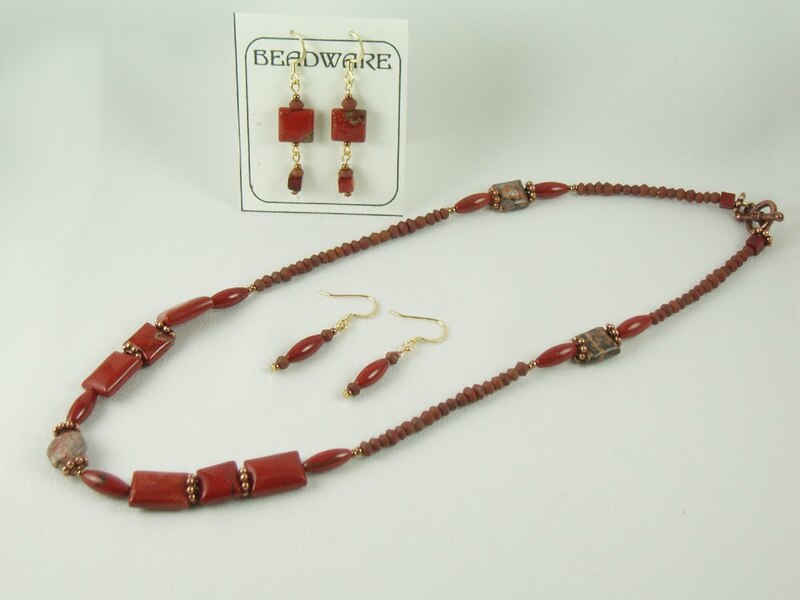 This is the result, a pretty necklace and earrings. I liked the color combination so I will make some other things with the left overs. Now that the big day is past I can post pics of some of the items I made for gifts. 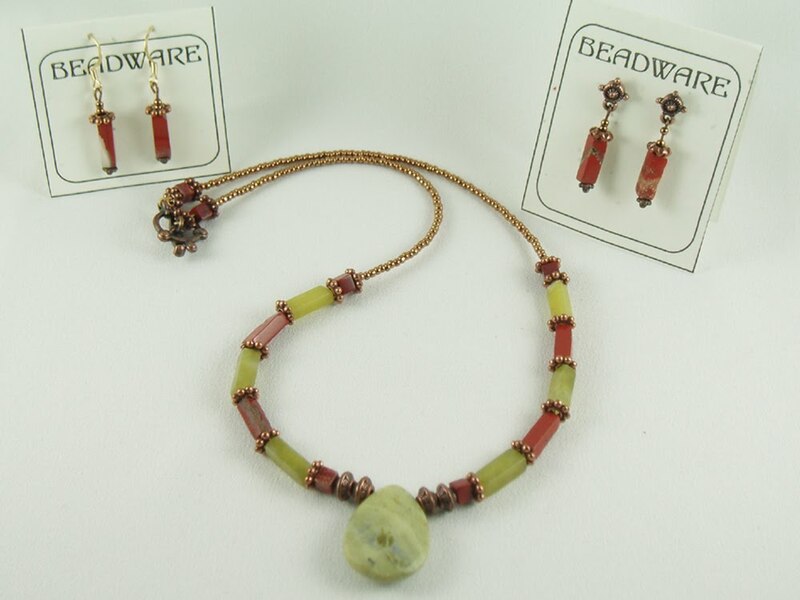 These were made for a friend in MN to match a coral necklace she bought over the summer. 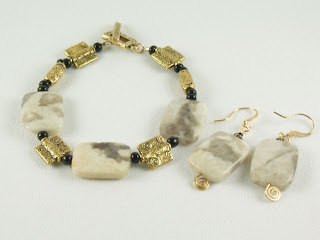 Pretty pieces of agate in beige and taupe accented by black glass seed beads and gold plated beads and toggle clasp. Matching earrings too. All have been SOLD. A new design. They look so rich! I will have to make some more in other colors. All have been SOLD. 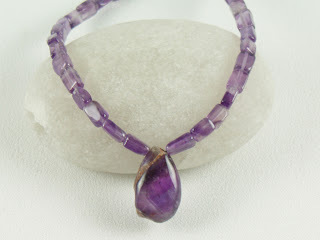 I try to take a few pictures every week of things in my inventory to list in my online boutique. I have a whole series of black and silver things I call "Starry Nights". 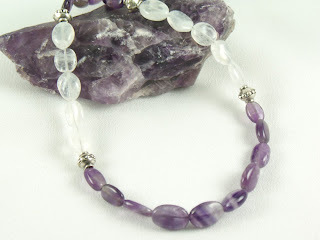 Here is a bracelet made with Bali silver beads and a silver plated star shaped toggle clasp. All have been SOLD. These require patience and tough fingers to make! It is like making a miniature bracelet. 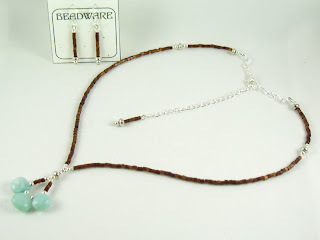 Cutting the memory wire - bending the ends - filling the wire with beads - making the silver dangle. They are priced 6 for $15 and 4 for $10. I use them for hostess gifts along with a bottle of wine. You could also use then to decorate a beer mug or coffee mug. Today I am working on holiday gifts. Unfortunately I can't share pictures or it'd spoil the surprise for some folks. 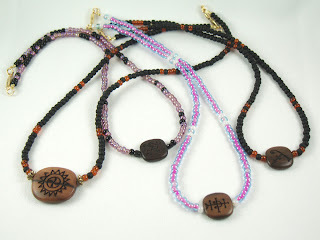 Sparkles, coral, jade, amethyst - they are looking good! This past weekends sale was so much fun! Thanks to everyone who came and visited. Above you can see Noelle's beautiful photography, our musical entertainment and a few of this displays. If you missed it you can still shop Beadware - use the links on the right or if you are local set up an appointment to visit my in-home studio. Today I am doing book work and putting all my items back into the studio. During my sale this weekend my Etsy Boutique is closed - so the link to the right will temporarily not work. Lots of items have been selling this weekend (yipee!) so there will be lots of changes to the inventory in my online boutique when I re-open it next week! 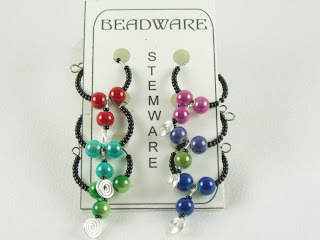 My sister and I have been scheming about an actual website for Beadware. 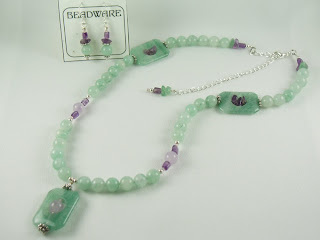 One of the steps is to get a domain - beadware.com is taken - it used to be a British software company and they are holding on to the name for now. So while I wait for that one I am going to start with something else. But what one? Here are some we are looking at. Let me know what you like best or if you have another idea! I finished painting my 2 new wooden street signs today. Well, new to me anyway! They are the kind that stand up on their own - sandwich board signs I think you call them. Not the perfect colors - but it is what I had in the garage! Hot out of the studio! Each is similar to something I have made before. One way I keep my prices affordable is to make one of a design and then make several more varying the color or accents. 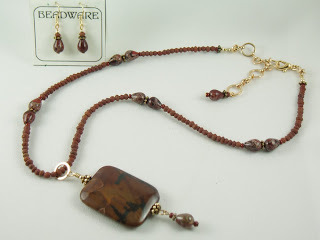 I seem to be doing a lot with stones lately, and especially things in browns and reds. Must be fall! All have been SOLD. 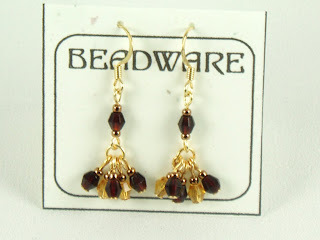 I am working on creating a fan page in Facebook for Beadware. 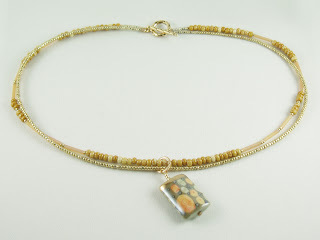 It has links to the blog and to my Etsy boutique! Check it out, write on the wall and become a fan! Once I reach 25 fans I can get a shorter address. I finally got a handle on taking pictures to post. I did some research, bought new light bulbs (mine were too cool - thus blue!) and did a bunch of test shots to determine camera settings. I am fairly happy with them, although I still do some work on photoshop. Here are 3 of things I had in stock and have just posted to my etsy store. I also have several new things waiting for pics, I want to get those listed by the end of the week. All have been SOLD. I recently took a beginning metal smithing class in Tacoma - what fun! 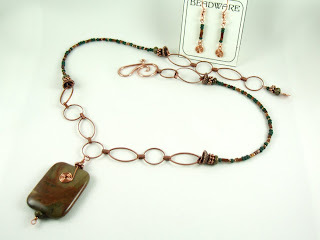 I created this copper dangle pendant. I am going to connect the parts and then hang a small bead from the bottom. The surface is more scratched than I would like, but hey it was my first try! I came away with some new friends, a new lunch spot (hot dogs anyone! ), a book, new techniques and a cool new tool. What better way to spend a Saturday. Sale Fliers in the mail! Watch your email inbox and snail mailbox for your invitation to my annual holiday sale. While you can shop in my new online store, I hope those that are in the area will come and say hello the first weekend in December. I have many more items than I can possibly post online - in fact I just looked at my records and I have over 500 (yes 500) pairs of earrings, 100 necklaces and 200 bracelets!!! Whether are looking for blue, purple, brown, green, gold, silver, stone, crystal or pearls I will have something for you. And you will have the chance to touch them and try them on. Jewelry not on your list? There will also be photographs of local wildlife - especially eagles and orcas, as well as beautiful watercolor notecards. Shop local and buy a handcrafted gift from someone you know. Come listen to music and enjoy a cup of hot cider. Feel free to bring a friend or two! I have been consumed with getting things listed in my new etsy shop this last week. Several hours everyday are spent at the computer. Photoshopping pictures to post, creating detailed descriptions and then uploading and editing. 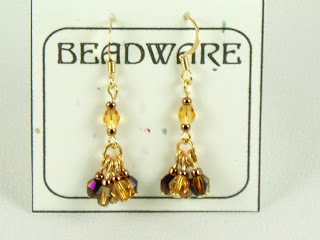 Once I get several pages of items I can take a break and get back to actual beading!! I had my first sale at my new shop!! 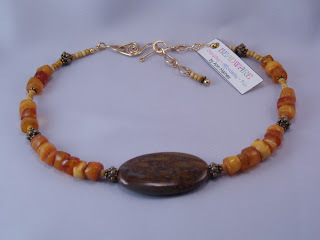 A beautiful amber and jasper choker that was only listed for a few hours before it was purchased by a woman in Texas. Now I have to figure out packaging and get it shipped to her. 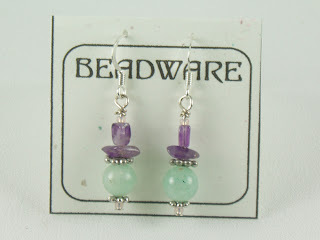 Grand Opening of Beadware online Store!! So how do you like my new banner?! Linda taught me how to use photoshop today and this was the result - who-hoo! We created it for my etsy store. Then I decided to upload it to my blog, but it was too long. So I got brave and found out how to edit the html code behind the blog template. Now not only does the banner fit, but I also widened the blog page so that there is not so much wasted space on the sides. Next I am tackling manipulation of photos of my work so I can list things for sale in my new etsy store. Onward and upward! Since my last post I have been busy learning new software programs (paint.net and now photoshop 7), trying to create a banner, playing with photos, setting up Paypal, and creating store policies all in preparation for the opening of an online store on etsy.com. 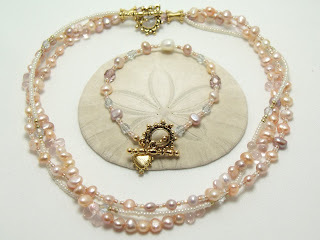 I will also figure out how to post a direct link to the new store on the sidebar of the blog. Boy what a learning curve!!! I have talked about this for several years, and in fact have had the site saved since October of 2007! It all seemed very overwhelming at the time, but now I am diving in. I hope to get a few items listed in the next week. The date for my own Holiday Sale is Dec 5 and 6th here in Southworth. This year there will be 3 artists and live music! 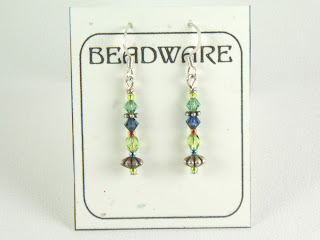 Beadware will be joined by water colorist Lesly Bush and photographer Noelle Morris. Toni Seales will provide beautiful flute music. Watch for your invitations in early November. I will have a booth at the Fremont Market several weekends in November and December. 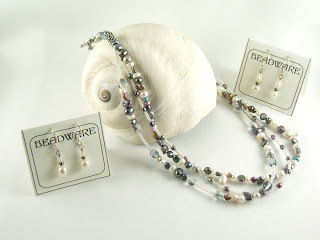 Private shopping can also be arranged - drop me a note and we can schedule a time for you to come to the studio. I am also open to doing small shows in your home for you and a few friends. If you know of other opportunities for me to sell my wares this holiday season please let me know! 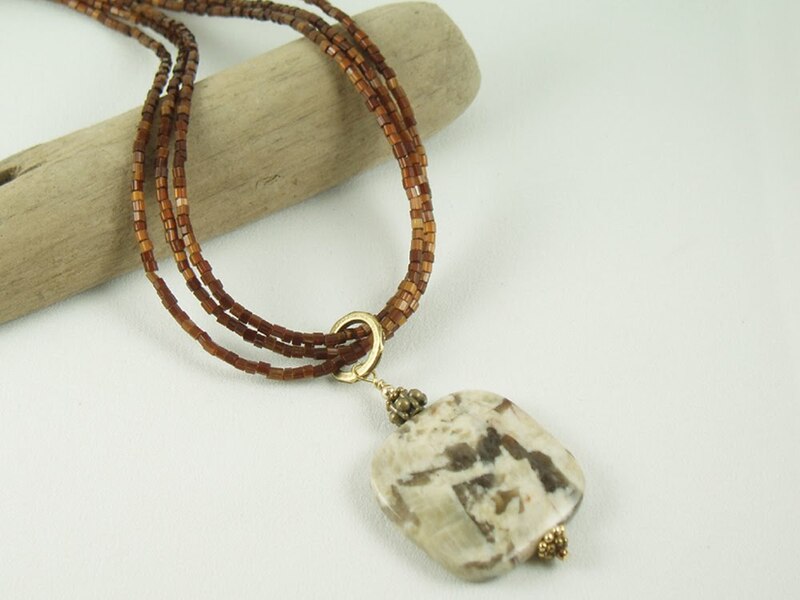 In addition to the trivia mentioned in the last post for serpentine, snakeskin jasper is a gemstone of protection and invisibility. It has a range of healing abilities. It guards against negative attitudes and actions, is useful in moving energy and helpful during massage and meditation, and it brings peace of mind. It helps provide a stabilizing energy to our lives and brings productivity and abundance to our minds and bodies. For mystical power, jasper was thought to drive away evil spirits and protect against snake and spider bites. 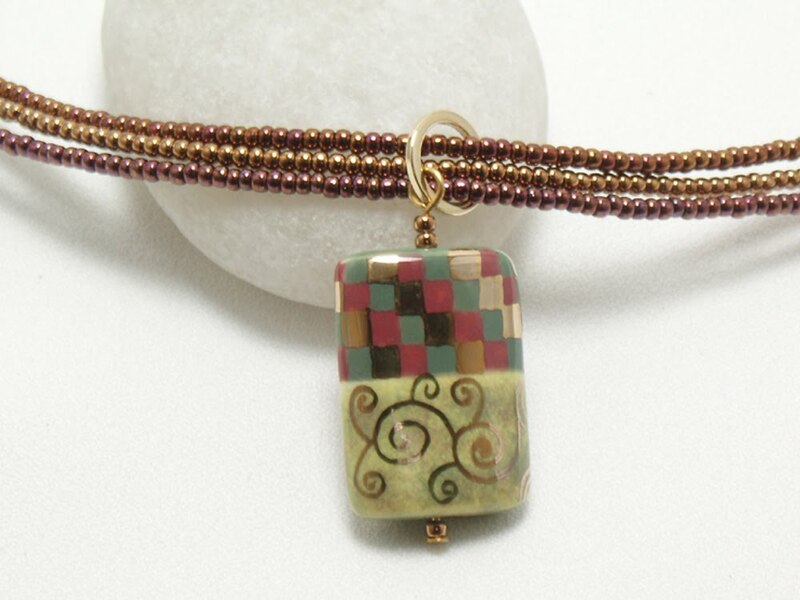 Seems appropriate since it is called snakeskin jasper! 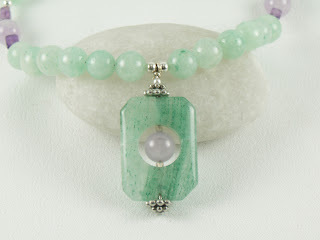 Serpentine makes an exceptional meditation stone. 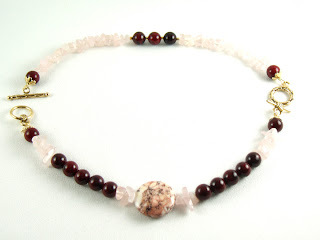 It helps you to find inner peace, protects against poisonous creatures such as snakes and insects, balances mood swings and encourages the ability to solve conflicts by peaceful means. It aids the clearing of blocked areas, brings the chakras back in balance and also is very beneficial for the heart chakra. 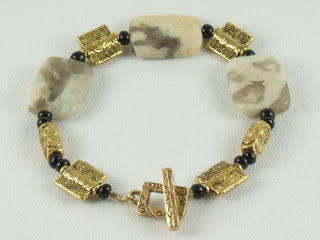 Its properties promotes good luck and helps people in achieving their dreams and desires. 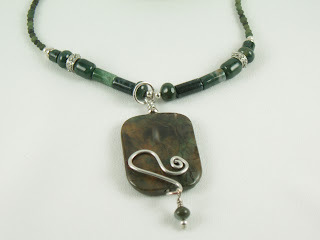 Serpentine is also very powerful in healing. It is an aid to kidney and stomach complaints, and relaxes cramps and menstrual pain in women. Sunday was a beautiful day to be out in Fremont. My first try at a booth there was a lot of fun. I will go back again in Nov and Dec, as well as in 2010. They have many vendors, farmers, crafts people, antique and flea market dealers. Quite the variety of wares available and quite the variety of people. A fun way to spend a Sunday. Thanks to Patty for helping out. It is grey outside today so I thought something bright was in order. This fills the bill. Simple but bright to pick up your spirits. 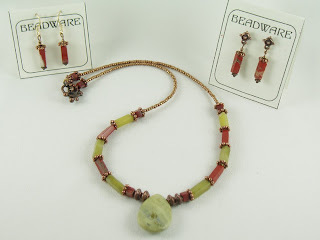 Color Cubed bracelet $20, earrings $8 All have been SOLD. This pretty set is called Autumn Topaz. 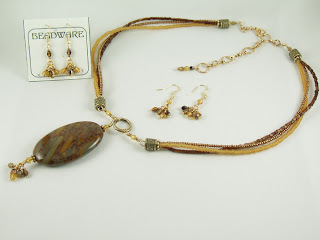 The triple strand necklace and bracelet are a mix of dark gold, dark topaz and rusty brown seed beads, brown and topaz teardrops and fall colored Czech crystals and bugle beads. The clasps are gold plated dragonflys. Necklace $25, bracelet $15 and earrings are $8. All have been SOLD. This Sunday I am going to give the Sunday Market in Fremont a whirl. Spaces are first-come-first-served so we will go early to increase our chances of getting a spot. Fremont is a very fun neighborhood and bills itself as the Center of the Universe. So come on down for a fun filled day! Glass Garden display from my new booth. 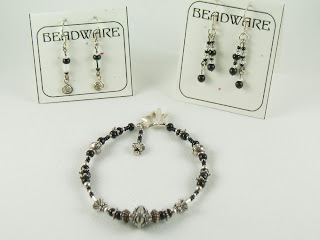 Double fringe bracelets $40, single fringe $30, earrings $8. All have been SOLD. Great Day at the Fall Fair! My first booth was a success. Thanks to everyone one who stopped by, gave feedback and shopped! Also a huge thank you to everyone who helped that day and with the preparation (Linda, Frances, Kate and Mike). Me and Frances ready for our first customers. Look at those nifty shutters - thanks Mike! It is dark this morning so good thing we have some lights. A bright and sunny afternoon and a booth full of shoppers!! I am a very happy camper.